The Blue Sonoma Stripe Collection is one of our best selling value wholesale fabric shower curtains. 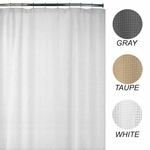 The Blue Sonoma Stripe Shower Curtains have vertical stripes in colors: blue, aqua, yellow and white. These soothing colors coordinate well with white or light-colored bath towels and bath mats. 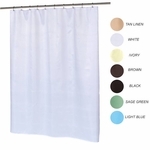 These 100% polyester Fabric Shower Curtains are water repellant, machine washable and fade resistant. Can be used with or without a shower liner.